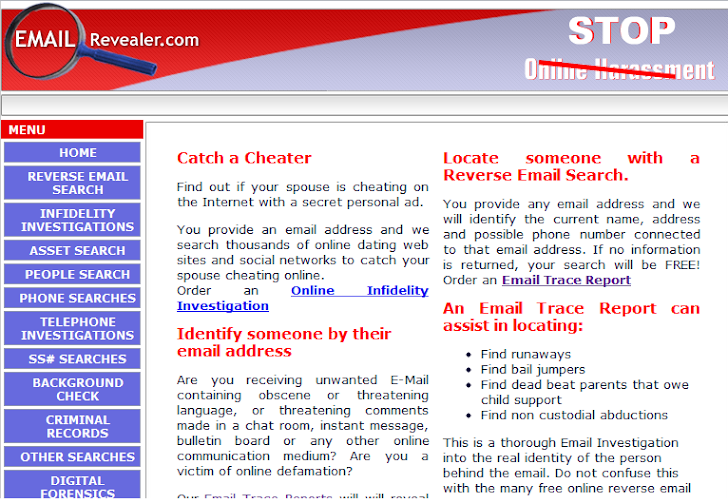 Emailrevealer.com Launches New Email Hacking Investigation service ! hacking into that email account and invading the account owners privacy. Ed Opperman, President Of Opperman Investigations Inc the owner of EmailRevealer.com, shares how these new advancements in email account security were developed. - "We have probably spent more man hours investigating emails than any other PI agency on Earth. We investigate cyber stalkers, Internet defamation and even developed a unique investigation service where we can trace an email back to a secret online personals ad on a dating site. It was this kind of intense study of emailing and the various email services that allowed us to develop these new techniques of investigating invasion of privacy and hacked email accounts." "We designed this method of monitoring email accounts to catch hackers and eavesdroppers with the cyber stalker in mind, says Opperman. "This investigation is tailored to catch the obsessed ex lover or spouse that is spying on a persons email account. We can document the intrusion and reduce that evidence to a report. In most cases it should be enoiugh information to make an identification of the hacker and hopefully enough evidence to get an arrest and conviction." Each year millions of email users report their email accounts have been hacked and unauthorized persons are invading their privacy by spying and reading their private email correspondence. Usually email account passwords are stolen by spammers who use the stolen email address to send out spam emails. But often times it can be an ex spouse, former employee or an obsessed ex lover who is reading the emails as part of a larger stalking case.. Other times it could be someone trying to steal your identify to apply for credit and drain your bank account. EmailRevealer.com's Email Hacking Investigations services purportedly can remotely monitor and document unauthorized access to an email account, usually locating and identifying the hacker. This new services is a compliment to their well known cutting edge high tech investigation services involving computer hard drive forensics and cell phone data recovery that have brought them into national attention over the past year due to their involvement in several high profile celebrity cases.